Following the VR Kit – HMD (VR Goggles), here’s the Wall ! 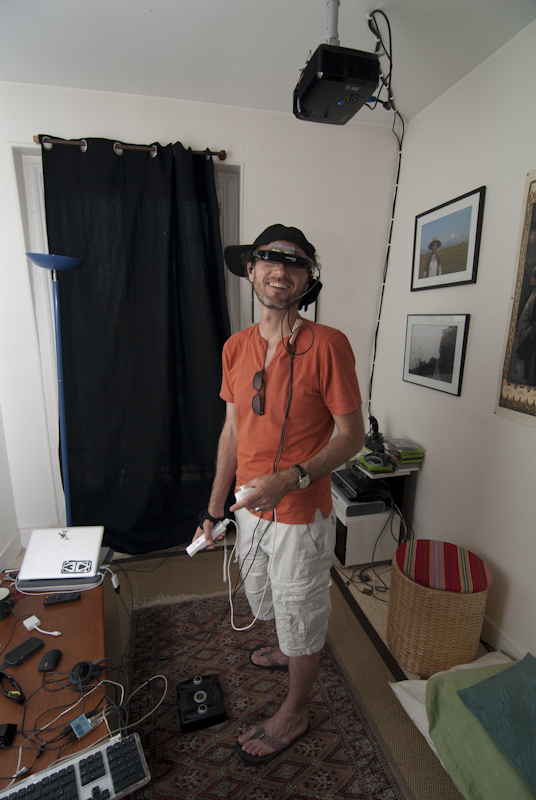 If you want to build one for yourself, join the VR Geeks ! I have to say I’ve been waiting to have this kind of setup at home for 15 years, and I could finally build one myself !! A 2.20m x 1m65 3d screen ! With that I can look at the 3D pictures and movies I took with my Fuji W1 3D camera, play (in 2D) with my game consoles, watch (2D) movies and .. get immersed ! 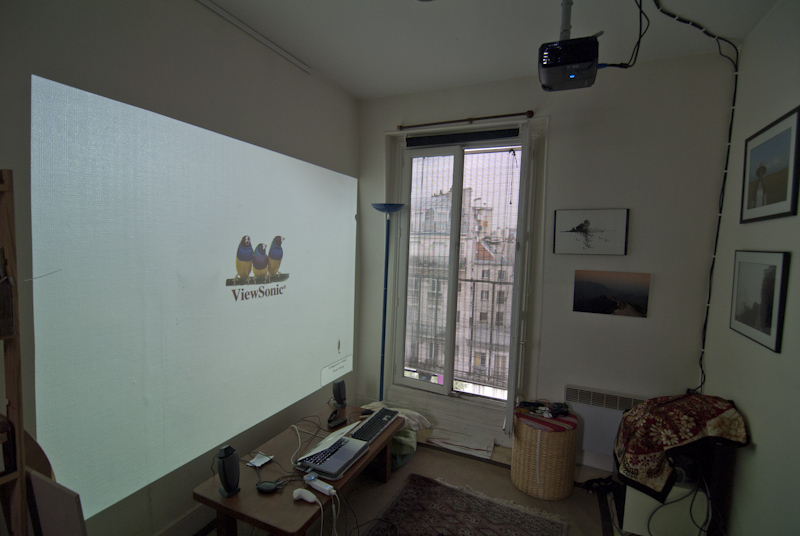 As you can see it fits in a very small parisian room. The projector has a throw ratio of 0.68, which gives me the 2.20m width at a distance of only 1.5m. This also has the big advantage that, as this is front projection, it allows me to get somewhat close to the wall without casting a shadow. Remember that every part is replacable by a more efficient one as long as you follow the VR Geeks specifications for the VR Kit – Wall! I especially hope to get rid of the Gametrak wires soon 🙂 And I also need to change my wallpaper, it has a too funky texture. Now we need good applications and games to go with all that !! So join the VRGeeks and start creating your setup and applications! Congrats on realizing your dream man ! Hope it enables you to create many wonderful things in your own home. very interesting photos. again, the cap pushed to the side. it’s classic! 3D television has been around but apparently hasn’t caught on until recently with the recent sports events. I would like to see these types of technologies develop further. do you know where this might go in the future? Now that the PS3 is S3D enabled, you can play S3D games on your TV and soon watch 3D Bluray. 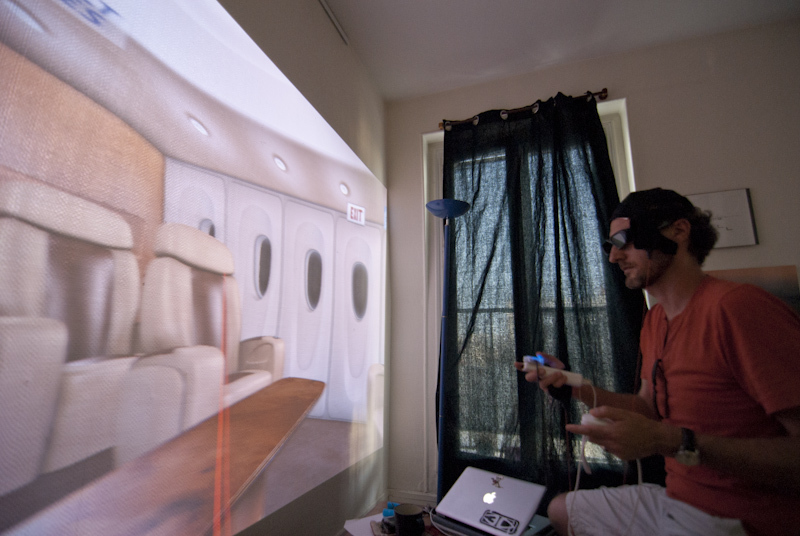 Then maybe immersive VR @ home if they add some sort of headtracking (easy with the PSEye), and tracking of hands (already in the pipe with the PS Move tracking device). Je vais mettre une nouvelle vidéo demain..
very nice. What is you opoinion about the projector is it up to par with the inFocus DepthQ? What framework do you use? Do the nVision drivers work also with OpenGL applications? Dimi, I haven’t played long enough with the Infocus to be able to compare it with the Viewsonic. 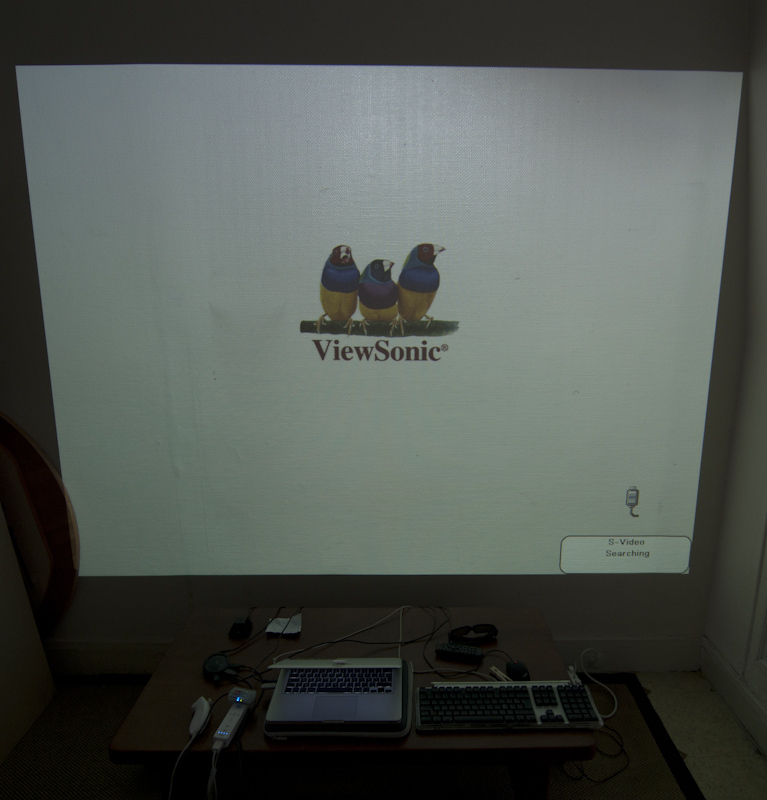 I have to say I was impressed with the very low ghosting of the Viewsonic !! Also it is very wide angle. This demo uses Virtools but I’m trying other frameworks. Sure any 3D tv can be used, the bigger the better ! 3D TV (LED based) from Samsung, LG, Sony! Only Mitsubishi is listed. Doeas anyone know if the tv sets also work although not mentioned on the site? It probably won’t work if not listed. It seems my projector at first was not on the list and then released new drivers and then it worked.